Today I am so excited to bring this guest post by a brilliant friend of mine all about added sugars. Jennifer Shukaitis has a Master of Public Health (MPH) and is an Assistant Professor/Educator in the Department of Family and Community Health Sciences at Rutgers Cooperative Extension. I hope you enjoy what she has to say! Many Americans consume much more sugar than is healthy. In fact, consumption of added sugars has steadily risen in the past few decades, and currently, the average American eats 22 teaspoons of sugar per day. Our bodies do need some sugar in order to function properly. For example, sugar provides the sole source of energy for red blood cells, and is the preferred source of energy for the brain and central nervous system. However, when it comes to sugar, it can be very easy to consume too much of a good thing. Natural sugars occur naturally in fruits, vegetables, dairy products, and some grains. Eating these foods, as part of a complete, balanced diet, provides enough sugar for our bodies’ needs. Our bodies do not need any amount of added sugars to function properly or stay healthy. Added sugars are those that are put into foods during processing or preparation, or that are added by the consumer before eating. 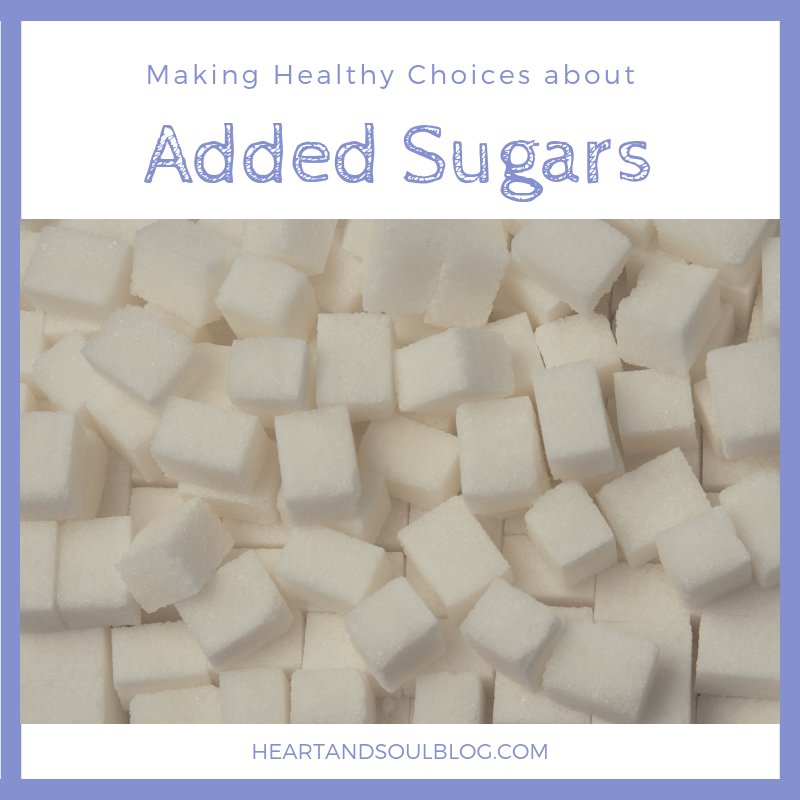 The term “added sugars” refers not just to white granulated sugar, which is what may come to mind when many people hear the word “sugar,” but also to any sweetener that contains calories. In general, foods that contain natural sugars are not a big concern. It is rather difficult to overdo it on sugar by eating foods that have naturally-occurring sugars. However, added sugars have been on the rise in the American diet for several years, which is concerning because of the effects that excess sugar can have on our health. Currently, the number one source of added sugars in the American diet is soft drinks. Soft drinks that contain added sugars include: soda, fruit-flavored drinks that are not 100% fruit juice, iced tea, lemonade, energy drinks, and sports drinks. Added sugars are found in many other foods, some of which may come as a surprise because they tend to not be considered sweet. Many other common foods that are major sources of added sugars include (but are not limited to): breakfast cereals, breads, pasta sauces, salad dressings, granola bars, yogurt, canned fruit, canned beans, and condiments like ketchup, barbecue sauce, and salad dressings. Pay particular attention to products labeled as “low-fat” or “fat-free,” as they often contain lots of added sugar to make up for taste that is lost when fat is removed. 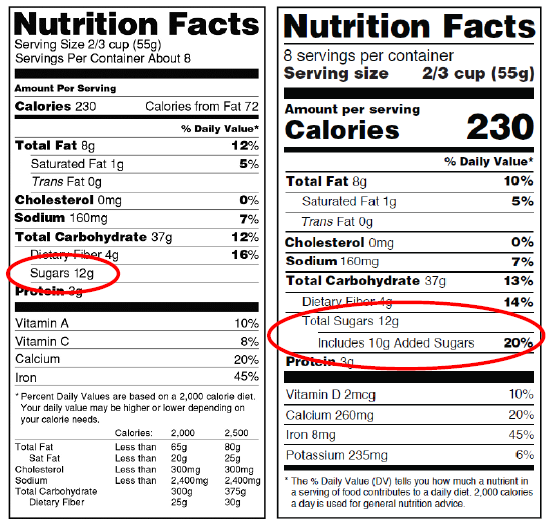 The new nutrition facts label, which will be required to appear on many foods beginning in the summer of 2019, will have a separate line for added sugars, which will make it simpler to know whether the sugars in that food are naturally-occurring, or added during processing. For example, if the nutrition label of a particular food lists 12 grams of sugar, that means that there are 3 teaspoons of sugar in one serving of that food (12 ÷ 4 = 3). Sugar sweetens food, thereby improving its palatability. Our bodies are programmed to like foods that taste sweet, so food producers tend to add sugars to their foods to make them more appealing to consumers. Why should I avoid added sugars? Consumption of added sugars can increase the number of calories a person consumes, without any added nutritional benefit, making it difficult to meet nutrient needs while staying within calorie limits. However, foods that contain natural sugars, like fruit, also contribute beneficial nutrients to the diet, such as vitamins and fiber. Excess added sugars in the diet can contribute to excess weight gain. Emerging research also suggests that there is a strong link between excess amounts of added sugars in the diet and health conditions such as unhealthful blood lipids, fatty liver disease, and inhibited insulin production. Added sugars are also a major contributor to dental caries (cavities). Currently, the average American eats 22 teaspoons of added sugar every day. This stands in sharp contrast to the recommendation from the American Heart Association that women and children eat no more than 6 teaspoons (24 grams) of added sugars per day, and men eat no more than 9 teaspoons (36 grams) per day. For reference, there are 16.25 teaspoons (65 grams) of added sugars in one 20-ounce bottle of soda. When reading a food’s ingredient list, it may not be easy to identify if there is added sugar in that food because sugar can go by several other names, depending on its source and how it was made. (source) One clue to finding sugars in an ingredient list to look for words ending in “-ose,” such as dextrose or fructose – all of these are some type of sugar. One common misconception is that some types of sugars – for example, honey, coconut sugar, fruit juice concentrates, or raw sugar – are more nutritious than others. However, there is no nutritional advantage to these types of sugars over traditional white, granulated sugar. Read nutrition facts labels. Remember to divide grams of sugar by 4 to get teaspoons of sugar! 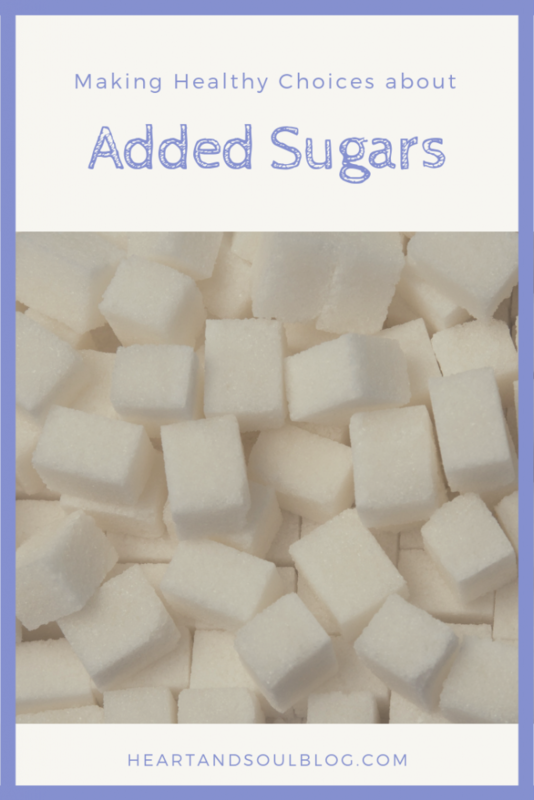 Learn sugar’s “aliases.” Look for these names of sugar on the ingredient lists to find out if a food contains added sugar. Buy unsweetened beverages and drink them as is, or add a small amount of sugar yourself. Even if you add a teaspoon of sugar to an unsweetened iced tea, that is much less sugar than most pre-sweetened varieties have. Swap out a sweet breakfast for a savory option. This can help to eliminate added sugars in your diet by cutting out common sweetened breakfast foods such as cereals and pastries. Do some detective work. Compare nutrition labels, and memorize brands that you know to be available in stores where you normally shop and can buy regularly. This may take some time to research and sort out initially, but will save you time (and sugar!) in the long run. Out of sight, out of mind! If you tend to keep sugary snacks out on your kitchen counter, desk at work, coffee table, or someplace else where they are visible and easy to grab, put them away! It takes a lot more work to go looking for a snack than to quickly grab one off the counter as you walk by. Keeping snacks “hidden” will reduce the likelihood that you will go looking for them, and in turn reduce your sugar intake. Thank you SO MUCH for this fabulous post, Jennifer!